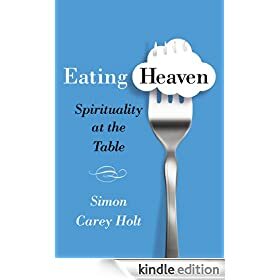 I may be biased, but my friend Simon wrote a terrific book last year, Eating Heaven. And I loved it. I read it very slowly and savoured every bite. Each chapter focusses on one table: the kitchen table, the backyard table, the café table, the restaurant table, right up to the table of communion. And each chapter has stories, interviews, history and reflections on that table: eating with mum and dad in the kitchen, sharing a meal with marginalised men and women at a free lunch, having a coffee with a chef between shifts, and so on. Each chapter then ends with a recipe reflecting the type of eating that happens at that particular table. More, they have an effect. Eating together is central to being human; and Eating Heaven reminds us of this gift. In my own household, reading it has triggered a couple of changes. For one, we have returned to a more intentional saying of grace. Despite trying various things over the years, grace had become a rushed magic formula that one or another kid would gabble as they reached for the serving spoon. It was worse than if we had not said it at all. But after reading this book, I have asked that we return to saying grace properly. Now we move between a candle and a responsive prayer; a minute’s silence before the meal; or held hands and a song depending on the mood – and we are loving this grateful pause at the end of the day, this moment of being together before we eat our dinner. Eating Heaven has also recalled us to simple acts of hospitality, which we largely left behind in the maelstrom of having a third child. A few years on, we’re again able to make time for a coffee with friends, or invite others to eat with us in our home; and Eating Heaven has been a catalyst for thinking about why we eat together and how to do it well. The stories, reflections and very good questions make this a book to savour, and slowly digest. Thank you, Simon.